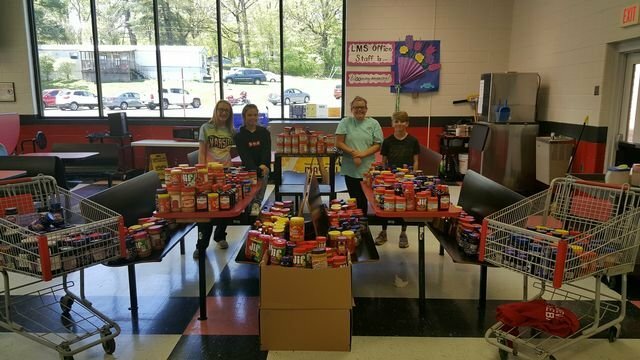 Lakeview Middle School FCA hosted the Spread the Love Peanut Butter and Jelly Donation Drive to benefit Young America Ministries in Catoosa County. This was an even where the entire student body and staff joined in to help those right here in our community. Through the generous students, staff, and community over 800 jars of peanut butter and jelly were collected. This will help feed an estimated 24,000 sandwiches to children within our community over the summer break. The peanut butter and jelly that was collected was donated to Young America Ministries. Throughout the summer they will feed over 100 children on a regular basis. They offer great activities for these children all through the year. If you would like to know more about this organization you can visit them at www.youngamericaministries.com.